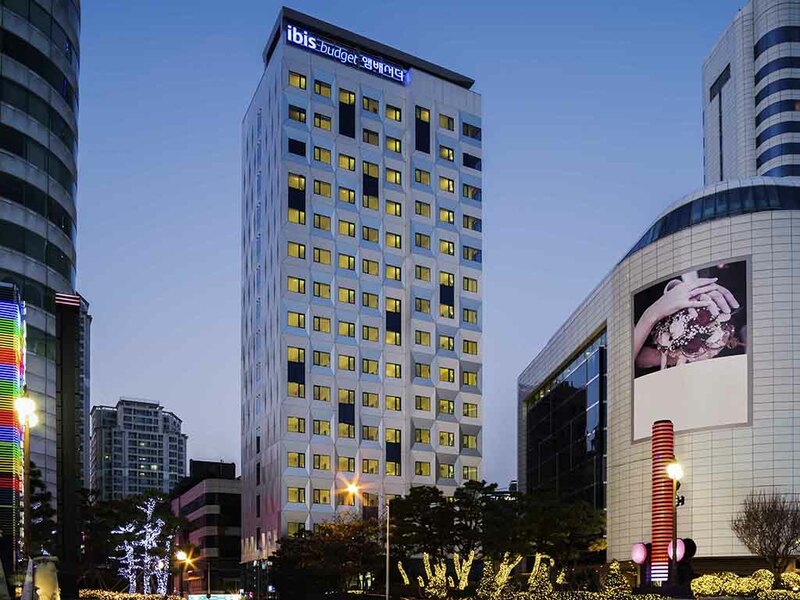 A scenic view of the ocean on one side and Busan city's skyline on the other, ibis budget Ambassador Busan Haeundae offers excellent accommodation and services at great value. This non-smoking hotel offers 180 rooms with multiple options suited to needs of solo business travellers to families on a leisure holiday. The La Matinee restaurant at the hotel serves International cuisines offering buffet breakfast and brunch, with a professional multi-lingual staff at your service round the clock. Haeundae is a major attraction for tourists for its scenic beauty and beaches. Apart from a must visit Haeundae Beach, Busan Aquarium, Dongbaek Island, romantic Dalmaji Hills, and Songjeong Beach are other destinations popular among the visitors. South Korea is an East Asian country that on one side, boasts iconic cities like Seoul and Busan, and on the other, has beautiful countryside full of colorful cherry trees. Visit to explore many Ancient Buddhist temples and other historic places. Beach front location, modern facilities, complimentary WiFi and multi lingual staff makes our hotel the only choice of international accommodation in Haeundae Beach, Busan. Clean, comfortable, convenient and friendly. We were looking for a place to stay for a weekend in Busan and the Ibis Budget was a great match. Staff was friendly and helpful, check-in and check-out was easy, the hotel rooms were very clean, it's a good location near the beach, and was just what we needed for a short get-away. Dear Rebecca G., We very much appreciate your comments regarding your stay at the ibis budget Ambassador Busan Haeundae. It is always a pleasure to receive positive feedback. Especially, I deeply appreciate your compliment regarding walk to beach, room condition, staffs service. I will share your comments with our team. I am sure that this feedback will serve as an encouragement to all of our staff as we strive to continuously improve the quality of our services. Thank you again for sharing your experience, and we hope your next visit will be as pleasant as the previous one. Dear Sarah N., We very much appreciate your comments regarding your stay at the ibis budget Ambassador Busan Haeundae. It is always a pleasure to receive positive feedback. Especially, I deeply appreciate your compliment regarding good location and reasonablae price. I will share your comments with our team. I am sure that this feedback will serve as an encouragement to all of our staff as we strive to continuously improve the quality of our services. Thank you again for sharing your experience, and we hope your next visit will be as pleasant as the previous one. We were really surprised to find a reasonable priced hotel, with modern room, big enough, with comfortable beds. a great view and good location. Dear Angela S., We very much appreciate your comments regarding your stay at the ibis budget Ambassador Busan Haeundae. It is always a pleasure to receive positive feedback. Especially, I deeply appreciate your compliment regarding good view and location, comfortable beds, reasonable price. I will share your comments with our team. I am sure that this feedback will serve as an encouragement to all of our staff as we strive to continuously improve the quality of our services. Thank you again for sharing your experience, and we hope your next visit will be as pleasant as the previous one. Great ambiance, great location and the frontdesk staff can speak english. For a touriest like me They can handle with my inquiry. Dear R. Rowel, We very much appreciate your comments regarding your stay at the ibis budget Ambassador Busan Haeundae. It is always a pleasure to receive positive feedback. Especially, I deeply appreciate your compliment regarding room condition and good location, staffs service. I will share your comments with our team. I am sure that this feedback will serve as an encouragement to all of our staff as we strive to continuously improve the quality of our services. Thank you again for sharing your experience, and we hope your next visit will be as pleasant as the previous one. If you want an ocean front room, get the ocean view rooms. It is a little more than city view but it's much cheaper than other hotels. It is centrally located and a short walk to all the eateries on the left and a supermarket on the right. In front, is the famous 2005 APEC venue. Great location, close to the bus station, staffs was very nice and willing to help us. Upgraded to &quot;Partial Seaview Room&quot;, good room amenities. Very comfy bed. Nice front desk staffs, provided many info which may make you trip even easier to be planned. One of the best self contain room with the best hotel. The hotel is one of the best hotel. My week experience was awesome. The staff were friendly and even everyone was very helpful. I enjoyed my stay there and truly I recommend visitors to choose to stay at Ibis. The room was comfortable and the breakfast was great. Waking up with a beautiful view would definitely boost your day. That’s how we felt during our stay here. The room is clean and tidy but the size is quite small. Our sea view room is nice. The staff is very helpful. The experience was good..although it was a budget hotel but it is quite spacious with space for 2 big luggage and still have room to walk.. the staff was helpful and variety of korean delights for the breakfast. The location is close to haeundae beach and also the bus stop which was cery convenient. Everything is neat and clean. Room size is approximate to single traveler. Location is good, staff is nice. It's amazing while being here. Nice ocean view. Sufficient level of amenities. Great location to the beach, cafes, and other attractions nearby. I am arrive hotel at 11am and try to have early check-in. The staff do it for us. But no room was provided after check-in process and paid, but told me that check in at 3pm. The room will available at 3pm. The staff did not want to work. I understand the check in time at 3pm, but the staff should remind that no early check in available. I am so disappointed. Clean and comfortable with good, comfortable, good environment. The room and the ocean view of this hotel are brilliant. However, the services attitude of the reception staff were fair. Requested the tax refund service upon check out. However, the staff didn’t check the passport details and name on the tax refund sheet were correct after using the passport reader machine , which caused the tax refund counter staff at the airport thought that the sheet doesn’t belong to me. Overall, the hotel is nice but it would be better if the staff pay more attention on details.